A star will not shine until it has assembled enough self [and] once it has enough self it cannot help but shine; once it starts to shine it cannot help but burn the self up and blow the self away upon the stellar winds. 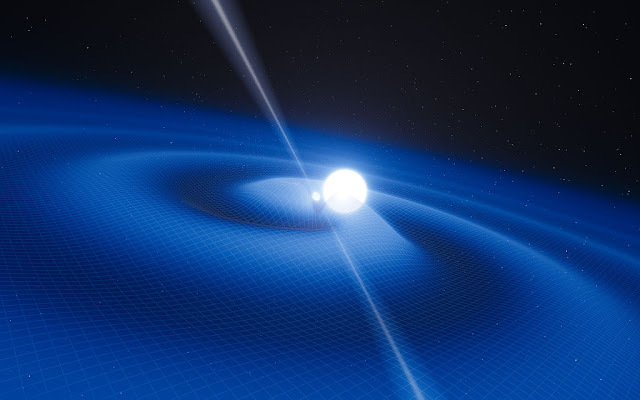 The star system PSR J0348+0432 consists of a white dwarf and neutron star 830,000 kilometres apart --about twice the distance from the Earth to the Moon. They orbit around each other once every 2 hours and 27 minutes. at a velocity of about 2 million kilometres per hour. The neutron star is about 26 kilometres in diameter and has mass is twice that of the Sun. It spins on its axis about 25 times a second. Gravity here is over a hundred billion times its value on Earth. General Relativity predicts, and measurements confirm, that the two stars will spiral in towards each other, emitting gravitational waves. A white dwarf that is not caught in such a system may continue to exist almost indefinitely – or at least 1032 years. Eventually, it may turn into a black dwarf. None of these exist yet because their precursors would have to be older than the universe.